I am Igo, webmaster of the ShopArt artists group, Germany. I made the small webpages for View Rock Resort - Koh Tao, and Beer's House - Koh Samui, just for fun and for no commission earning reasons, what may be the idea behind many other travel advisory websites. I also answer incoming e-mails, if customers may contact ShopArt in case of the resorts e-mail postbox may be down or stuffed with spam. You probably will arrive at new BKK International Airport, Suvarnabhumi in the Southeast of Bangkok, which end of Sept. 2006 replaced the old Don Muang Airport in the North. As always: Avoid to go with people who try to offer you cheap taxi service, as they charge much more and are very insecure. On the lower basement left side in front of a very good and cheap Thai Self Service Restaurant you find an official taxi counter, where you can book taxis in all directions for acceptable prices. A direct Shuttle Bus to Pattaya leaves there as well at 8 a.m., 11 a.m., 3 p.m. and 7 p.m., and there is a second one going also at 9 a.m., 1 p.m., 5 p.m. and 8 p.m. If you are in a hurry want to take a taxi into BKK town or even far more away, a trick is just to go up to the departure platform and catch an incoming meter-taxi outside, dropping passengers there. But you should be quick, as taxis from outside may face problems if trying to find new customers instead of returning empty to town. In general: never forget to ask for the approximate price before entering a taxi. F.e. taxi to Kao San Rd. is about 300 Baht, taxi to Ekamai Eastern Bus Station is about 200 Baht. Or ask the driver to leave the meter switched on, prices then often are much lower than expected. But if you are not in a hurry, it is better just to take a short walk on the basement to the new SkyTrain Station of the Airport. The line is not yet completed, but it takes you to the center of the town and from there its easy and cheap to take a meter Taxi to your destination, f.e. 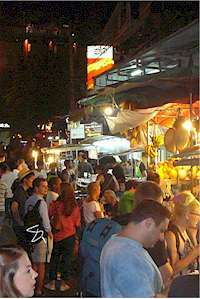 Kao San Road. And an other advice: Leave your gold necklaces and bracelets at home, as gold and ladies' pocket snatching has become a widespread sport amongst Thai youth gangs especially in the tourist areas on the mainland. A second advice: Take an old spare Nokia cellphone with you. Charging it with a rechargeable prepaid Thai simcard may cost only 6-8 Euro, and then you can phone cheap within Thailand and also abroad, then predial 009. Best services are One2Call(=AIS) or DETAC, and phone shops where you can buy sims and refill cards you will find everywhere and also directly at the arrival exit area of Suvarnabhumi Airport. And if having Laptop, i-Phone, Tablet or Netbook with simcard-slot inside or external simcard-stick, you can get also rechargeable simcards for internet connection there for only 4-5 Euro monthly fee there. 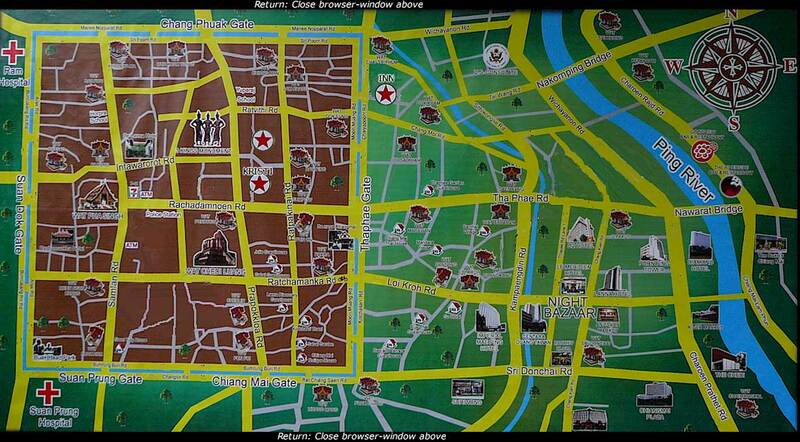 But you will also find many Guesthouses and Restaurants with WiFi-Hot-Spots for free on Rambuttri or Kao San Road. For me in Bangkok the Banglampoo / Kao San Road is the best area to stay as all interesting sights are nearby. It has a fantastic shopping area and nearly no redlight scene around. Best Dining Area in the evening is at the end of Rambuttri Road, where many mobile kitchen restaurants offer excellent Thai Food for very low prices. 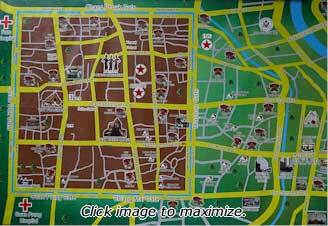 The streets backside and around the temple on top of Kao San Road have some good guesthouses. Best and worth the price is Rambuttri Village, phone +66 (0)2 2829164. Swimming pool on rooftop, single room incl. a fantastic breakfast-buffet is 880 Baht, double about 1.200 Baht. But you should make reservation in advance online to be sure you get your room, and may be for an even cheaper price. However I prefer low budget hostels like PAILIN Guesthouse, which is situated on the banks of a small channel and very quiet, no muezzin howling in the morning at 5 o clock. Or the SS Suksawad Hotel in a small street on opposit side. Double with aircon app. 500 Baht. Another very romantic Boutique-Hotel in Rambuttri Rd. / Kao San Area is "Villa Cha-Cha". The double with aircon below 1,000 Baht economy price, but not to be mentioned on their website villachacha.com, so ask for via phone +66 (0) 22801025-7. Another possibility for advanced booking and often getting cheaper prices than offered, when booking direct at the hotel receptions is Bangkok Hotels or try to look at www.HotelTravel.com. - There you will find a wide choice of hotels with different room rates in Bangkok and all over Thailand as well. For middle budget travellers I would recommend the completely renovated and very traditional big Royal Hotel Bangkok. Double may be about 30 Euro when booking via Internet, and here you get maximun value for the price. For low budget travellers its also worth comparing www.khaosan-hotels.com. And for those, who want to avoid the hussle of Khao San Road, I recommend "The Chilli", situated near Oriental Hotel, and River City Shopping Center, and not far away from Huanlampong Railway Station. It looks like a youth hotel from insinde with only small bedrooms. However it has its special charm and offers internet and coffee for free. As the river with its expressboats is nerby, there is no problem to get quickly and cheap wherever you want. However avoid the new and expensive "Tourist Express Boats" who now compete with the municipal Express Line and try to catch away the tourists from them on the most frequented river sections. Even if you just make a jump with them for only 1 distance, they charge 40 Baht - 8 times as much as the normal Express Boats. Warnings about their high pricing can be found on every river boat pier, but cleverly written only in Thai. To see the 3 most important sights of Bangkok, you go from Kao San Road down to the river (5 minutes), take the Express Boat to Grand Palace or Wat Pho (big old Monastery). At the Wat Pho Pier there is is small ferry bringing you across the river to Wat Aroon, all ferries are very cheap. For Grand Palace and its holy temple inside, the b>Wat Phra Kheo, you need shoes and long trousers, as the King sometimes lives there and foreign visitors should look nice. Entry fee is about 400 Baht for tourists, Thai citizens are free. If not having you can get shoes and trousers for free on the entrance, but leaving then 500 Baht deposit behind. Best method to go to Koh Tao for my opinion is taking the Lomprayah High Speed Catamaran, which has its office direct on Rambuttri Rd, parallel of Khao San Road in BKK. More about see their website lomprayah.com (Phone BKK 026292570 or 1). Lomprayah connects the Islands Koh Tao, Koh Phangan and Koh Samui and starts as well as from Chumphon as from outside Surat Thani. And they have their own buses starting daily from Khao San Road in the morning and in the evening. Koh Tao is the third island in the Koh Samui island chain in the Golf of Siam: Koh Samui - Koh Phangan - Koh Tao. It has a very long main beach starting from harbour but not very wide (Sairee Beach). Best place to stay there is "Seashell Resort" but quite expensive now. If you want to go immediately to Hin Wong Bay, then after boat arrival have a look for the black offroad car of View Rock Resort. It will take you for free over to Hinwongbay, if you check in at ViewRockResort. And if you prefer to stay in the socond resort situated also there, it costs only 100 Baht. If not finding the car, you can phone View Rock Resort: mobile 081 2294307 or 081-2294829 and they will pick you up then. To make reservation there better take +66 (0) 77-456548 or 9, as mobile is only connected when Nao is in front of the hills in the horbour area. The Hin Wong Bay is rocky and has no beach at all, but instead a very huge relaxing terrace. Anyway its worth to have a look at, as it is really nice and quiet there and good for snorkelling. Reservation normally must not be done, as travellers check in and out every day up to their own time decision, and there is no deposit money asked for in advance, so even reservations are quite unreliable for the ViewRock people. However, if you want to feel safe, phone View Rock Resort at +66 7745654-8 or -9, or send them an e-mail: viewrock@hotmail.com. And dont make any booking in advance with people on ferreyboats or at the train stations trying to convince you for early decision. Better have a look first, and then decide. And, if interested, click here and have a look into some pages of the diary, which Mats from USA sent to me. 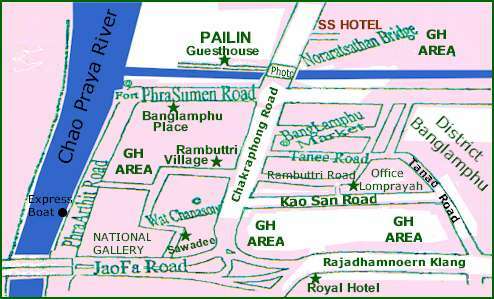 And here some more hints: If coming to Chiangmai in Northern Thailand and looking for a quiet accomodation for a reasonable price, have a look at Chiangmai Inn Guesthose in Road Chaiyaphum, Lane 2, 15/1 Soi 2 (see map). phone +66 (0)53 251400 or +66 (0)53 251401 (www.chiangmaiinn-gh.com). The double with fan, toilette and warm shower is about 250 Baht only. The Chiangmai Inn people organize good trekking tours to the forests near the Burmesian border and to the hilltribes (3 days about 2.000 Baht). And in case that Chiangmai Inn is occupied, just cross the townwall channel, go left side and then at Thapae Gate turn right into Rajadamnoen Road. If you enter Soi 5 on right side opposite Wat Phan Ohn Temple you will find many more nice guesthouses with reasonable prices, f.e. White House, Kavil Guesthouse or Kristi House. Opposite the latter is a Thai Cooking School (www.asiascenic.com). If interested in visiting the UNESCO World Cultural Heritage Town of Luang Prabang in Laos or Angkor Wat in Cambodia, please have a look on www.shopart.com/luangprabang. Return: Close browser-window above.